It has been argued that the use of big data in scientific research obviates the need for causal knowledge in making sound predictions and interventions. Whilst few accept that this claim is true, there is an ongoing discussion about what effect, if any, big data has on scientific methodology and, in particular, the search for causes. One response has been to show that the automated analysis of big data by a computer program can be used to find causes in addition to mere correlations. However, up until now it has only been demonstrated how this can be achieved with respect to difference-making causes. Yet it is widely acknowledged that scientists need evidence of both “difference-making” and “production” in order to infer a genuine causal link. This paper fills in the gap by outlining how computer-assisted discovery in big data can find productive causes. This is achieved by developing an inference rule based on a little-known causal process theory called the information transmission account. Allison L., Edgoose T., Dix T. I. (1998), Compression of Strings with Approximate Repeats [in:] Intelligent Systems in Molecular Biology: Proceedings from the American Association for Artificial Intelligence, J. Glasgow (ed. ), Menlo Park, CA: AAAI Press, 8-16. Anderson C. (2008), "The End of Theory: The Data Deluge Makes the Scientific Method Obsolete," Wired Magazine, June 23. https://www.wired.com/2008/06/pb-theory. Collier J. (2010), Information, Causation and Computation [in:] Information and Computation: Essays on Scientific and Philosophical Understanding of Foundations of Information and Computation, G. Crnkovic, M. Burgin (eds. ), London: World Scientific, 89-106. Gillies D. (2000), Philosophical Theories of Probability, London: Routledge. Godfrey-Smith P. (2010), Causal Pluralism [in:] The Oxford Handbook of Causation, H. Beebee, C. Hitchcock, P. Menzies (eds. ), Oxford: Oxford University Press, 326-337. Gray J. (2007), Jim Gray on eScience: A Transformed Scientific Method [in:] T. Hey, S. Tansley, K. Tolle (eds. ), The Fourth Paradigm: Data Intensive Scientific Discovery, Redworth: Microsoft, xvii-xxxi. Grünwald P. (2007), The Minimum Description Length Principle, Cambridge, MA: MIT Press. Grünwald P., Myung J., Pitt M. (2013), Advances in Minimum Description Length: Theory and Applications, Cambridge, MA: MIT Press. Hall N. (2004), Two Concepts of Information [in:] Causation and Counterfactuals, J. Collins, N. Hall, L. A. Paul (eds. ), Cambridge, MA: MIT Press, 198-222. Hawking S. (2015), "Stephen Hawking Says He's Solved a Black Hole Mystery, but Physicists Await the Proof," accessed 10.04.2015. http://phys.org/news/2015-08-stephenhawking-black-hole-mystery.html. Helft M. (2008), "Google Uses Searches to Track Flu's Spread," access 10.04.2015. https://www.nytimes.com/2008/11/12/technology/internet/12flu.html. Howson C., Urbach P. (1993), Scientific Reasoning, Chicago: Open Court. Hume D. (1978), A Treatise of Human Nature, L. A. Selby-Bigge, P. H. Nidditch (eds. ), Oxford: Clarendon Press. Iba H., Garis H., Sato T. (1994), Genetic Programming Using a Minimum Description Length Principle [in:] Advances in Genetic Programming, K. Kennear (ed. ), Cambridge, MA: MIT Press, 265-284. 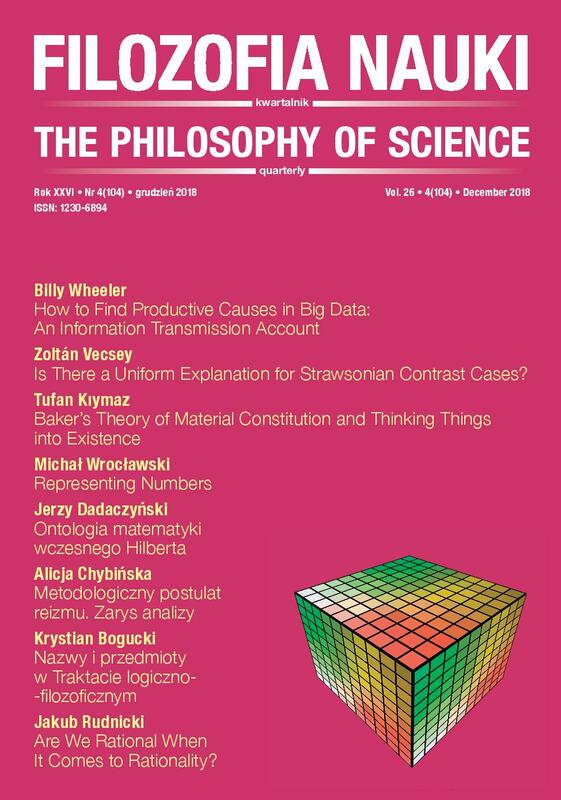 Illari P., Russo F. (2014), Causality: Philosophical Theory Meets Scientific Practice, Oxford: Oxford University Press. Kolmogorov A. (1965), "Three Approaches to the Definition of the Quantity of Information," Problems of Information Transmission 1(1), 1-7. Laney D. (2001), "3D Data Management: Controlling Data Volume, Velocity, and Variety," Application Delivery Services 949, 1-4. Manrai A. K., Cui Y., Bushel P. R.,…, Patel C. J. (2017), "Informatics and Data Analytics to Support Exposome-Based Discovery for Public Health," The Annual Review of Public Health 38, 279-94. Mayer-Schönberger V., Cukier K. (2013), Big Data: A Revolution that will Transform how we Live, Work and Think, London: John Murray. Pierce J. (1961), An Introduction to Information Theory: Symbols, Signals, and Noise, New York: Dover. Pietsch W. (2016), "The Causal Nature of Modeling with Big Data," Philosophy and Technology, 29(2), 137-171. Popper K. (1959), The Logic of Scientific Discovery, New York: Basic Books. Preskill J. (1992), Do Black Holes Destroy Information? [in:] Black Holes, Membranes, Wormholes, and Superstrings, S. Kalara, D. V. Nanopoulos (eds. ), Hackensack, NJ: World Scientific, 1-18. Ramsey F. (1990), Philosophical Papers, Cambridge: Cambridge University Press. Salmon W. (1984), Scientific Explanation and the Causal Structure of the World, Princeton: Princeton University Press. Shannon C., Weaver W. (1949), The Mathematical Theory of Communication, Urbana: University of Illinois Press. Wild C. (2005), "Complementing the Genome with an 'Exposome': The Outstanding Challenge of Environmental Exposure Measurement in Molecular Epidemiology," Cancer Epidemiology, Biomarkers and Prevention 14(8), 1847-1850.